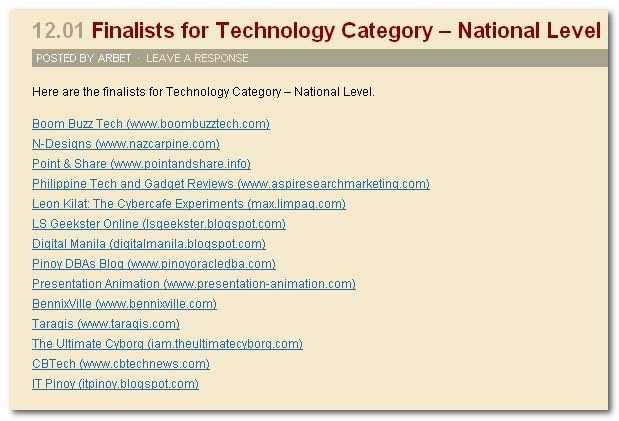 Not too late to share.Bennixville was nominated as one of the finalist at Philippine Blog Awards 2011 in National Level Tech Category, an honor for newbie blogger like me. Two of my blogmates, SEOGEEKSTER.com (own by Kira Permunian) and Taragis.com (own by Bon Talampas) are also finalist in the said category. An email came yesterday, inviting me to attend the awarding night at Carlos P. Romulo Auditorium, RCBC Plaza, Makati City tonight (Dec. 3).Seems bad I couldn’t come, I’m out of budget and can’t leave my work here. I will try to contact my friend in Manila to be my representative, hope he’s not too busy.lol..
BTW, before I will end. Thanks to all my blogmates from Proudly Pinoy Bloggers (PPB) and United Bloggers (UB) who heartily supported us. Thanks for the PBA team. Advance congratulation to the winners….